Are You Brave Enough to Try a Meal of Insects? Not having an ocean nearby, people in Nagano tend to get creative with sources of protein. One source that has typically been common deep in the countryside is insects. From grasshoppers stewed in syrup to bee larvae, you can challenge your culinary limits here in Nagano. 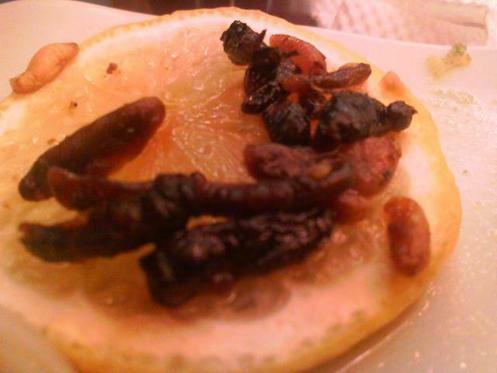 Gotoku-tei boasts several menu items featuring insect cuisine. Once only limited to areas isolated from normal trade routes, insect cuisine is gaining broad attention lately as healthy food perhaps contributing to long life. "Inago" grasshoppers stewed in light soy sauce, sugar and sake, "zazamushi" (the young of aquatic insects) marinated tsukudani-style or battered and fried -- mostly common in southern Nagano's Ina district, and "hachi no ko" bee larvae are just some of the examples. Gotoku-tei in central Nagano City offers insect dishes for those daring enough to try. Varies. Dinner set menus from 2000. Basic English available. Don't let the secretive, basement location or the ninja related decor surprise you. The owner, Miyashita-san, is a practitioner of Togakure-do ninjutsu. From Nagano Station(JR Hokuriku(Nagano) Shinkansen), From Zenkoji Exit, go northeast on Nagano Odori 2 blocks to Minani Chitose Koen signal and turn right to the "T". Restaurant is in basement of building on near left. From Nagano IC, Take Route 35 / Route 117 into central Nagano City. Nagano Dai-Ichi Hotel : Business Hotel Minutes from Nagano Station, Famous for Free Soba Noodles at Breakfast. Hotel Metropolitan Nagano : Full-scale "Grand Hotel" Adjacent to Nagano Station. Zenkoji Fuchinobo : Temple Lodging along Zenkoji's Main Approach, Famous for Vegetarian Shojin Cuisine. Suyakame Main Store : Original Miso-Based Menu at Zenkoji's Original Miso Maker. Monzen Machiya Gallery Juniten : 86-year old Renovated Machiya Near the Entrance to Zenkoji. Ogawa-no-sho Daimon Shop : Nagano's Own Oyaki Dumplings Cooked on Coals on a Hearth. Yayoiza : Serving Nagano's Heritage Cuisine at the Entrance to Zenkoji. Gibier (Wild Game Meat) : Are You Game to Try Game? Do as the Nagano-ites Do and Eat Wild Game Meat. Learn How to Make Miso Paste : Learn How to Make Miso Paste at Nagano City’s Premier Miso-Maker Suyakame. Learning to Make Oyaki Dumplings Near Zenkoji : Make Oyaki Dumplings at Ogawa Village’s Zenkoji Shop. Guided Tour of Zenkoji Temple : Tour the Venerable Zenkoji Temple with the Knowledgeable Bonsho no Kai Volunteers. Togakure-ryu Ninja Training : Sneak a Peak into the World of Ninjas be a Lesson with a Togakure-do Master!